B. Thomas (Arlington, Texas, United States) on 25 February 2011 in Landscape & Rural. Glacier Park Boat Company's historic wooden boat, Chief Two Guns, arrived at the dock for our ride across Swiftcurrent Lake. Once across the lake, we hiked about a half mile, caught another boat across another lake, and hiked on to a third lake. The boat rides shaved a few miles off the hike since we caught the boats for the return trip as well. Lovely foreground detail in this vista. A very nice composition. It does look very scenic and green. This reminds me of the boat that shuttles hikers across Saddlebag Lake in the 20 Lakes Basin, just outside the eastern entrance of Yosemite National Park, off highway 120. The boat ride means you don't have to hike around Saddlebag to get to the trails. One time my brother and I did not want to wait for the boat, so we hiked around. I hated it, because the talus was very hard on my feet and knees, especially on the return trip when I was tired from being out all day. The next year we took the boat! @Julie Brown: I know what you mean. The year before we missed the first boat, and hiked around the lake, up to the second lake, and had to turn back before we wanted to. Besides saving steps, time, and energy, the boat rides were a treat well worth it. We didn't get out of Yosemite in time to visit the 20 Lakes Basin area because it was our first trip to Sequoia and Yosemite. Is it worth giving up some days in the Park if we go again? I have to wonder if the name of the wonderful, old, wooden boat has anything to do with the two prominent mountain peaks in the background. After reading Julie's comment, I can't help but think of your poor knees! 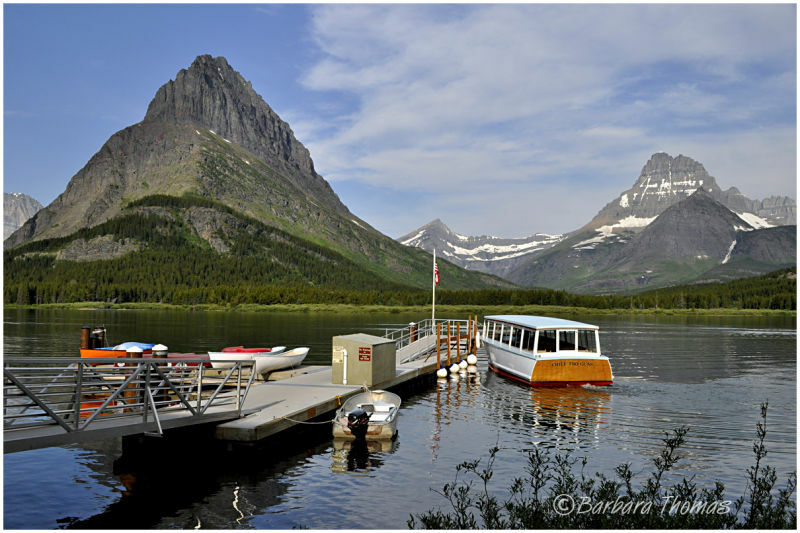 @Judy aka L@dybug: Judy, Chief Two Guns, a 45-foot, 49 passenger vessel of Swiftcurrent Lake at Many Glacier. Chief Two Guns was built in 1961 by Glacier Park Boat Builders. I don't know where the name came from and don't know anything about any mountains by that name, other than Chief Mountain, which is not visible here. My knee trouble really hit hard in September, so I was going strong in July, but I was still happy to cut a few miles off the hike to Grinnell Lake by taking two beautiful boat rides each way. Even with the boat, I'd have a hard time with most of those hikes right now! Glad you like the shot. A fine shot of this old, but very serviceable boat. Nice idea... to hike then get to sit and enjoy the scene while getting transported to the new stop. A great looking lake shot. This is so crisp and colorful. Beautiful work, Barbara. OK I could handle a boat ride in one of those, What a view!! Great image, Barbara! Beautiful scenery, magnificent colours, a very nice composition! That depends on where you are in the park. If you are down in the valley, it is a bit of a drive to get up to the high country. However, if you are already in Tuolumne Meadows (my favorite place), I do think it would be worth it to drive out the east gate and at least spend a half day in 20 Lakes Basin. Thanks for your additional info ... and we know where Chief Mtn. is. We had engine trouble heading south and pulled off the road, only to be rescued by Jack Gladstone, spokesman for the Blackfeet Indians. (If you go back to your image, this link is active.) I could go on and on, but will let you explore his website. He gave us two tapes of his music, which we still love; Buffalo Cafe being a favorite. Because you love this area, it think you may make a connection. @Judy aka L@dybug: Judy, I do remember from a previous post about your trouble near Chief Mt. How cool to be rescued by Gladstone. We missed getting to hear him at one of the lodges by a night or two. I do have some of his music - love "With the Coming of the Horse" from Buffalo Cafe CD, and lots of others. Thanks for the link. I will enjoy looking at it. His music is also on iTunes. PS: Be sure to look at the Glacier Park Programs link at the top of the page. Wow! that is some fine mountains capture.. i would love to explore a place like that...great capture.